St Petersburg is not only a big city population‐wise (it's the 4th largest city in Europe after Istanbul, Moscow and London), but also in terms of its surface and distances. So in order to get a first overview of this vast town it’s a good idea to be shown around by a guide on a bus. Some bus tours can pick you up straight after you've arrived at the ferry port, others conveniently collect you from your hotel. Typical for Russia are the Christian Orthodox churches and their unique onion‐shaped towers. There are several in St Petersburg, but if you just have time for one, make sure it's this one. Also known as the Church of the Savior on Spilled Blood or the Church of Resurrection on Spilled Blood, the building was erected on the very same spot where the former Russian tsar and Emperor Alexander II was murdered in 1881. Many visitors think that the beautifully decorated inside is even more impressive as the outside. And the best thing: unlike in other orthodox churches in St Petersburg, you can take as many photos and videos as you like here! Entrance is 250 Rubel (about 3,60 Euros) for adults. 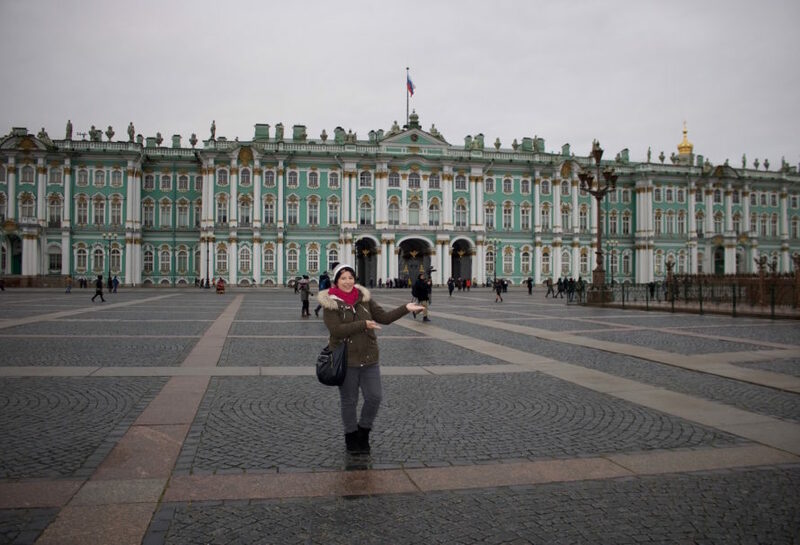 Follow in the footsteps of the film Russian Ark (2002), which was shot here at the Hermitage Museum in just one single take, and be amazed at the wealth of art treasures you will find here! In terms of gallery space (not even actual space), the State Hermitage Museum in St Petersburg is the second largest art museum in the world after the Louvre in Paris. Thus, you might get a little overwhelmed initially. A tour with a guide is a good idea to get a first overview of this huge museum (and to skip the line)! Part of the museum is located in the former royal family's Winter Palace. So be prepared to see a lot of gold and lavishly decorated imperial rooms here, too! Entrance is free for students. The first Thursday of each month is free for all, but you need to still get yourself a free ticket. For more info, visit the museum website. If you can handle even more art, you should check out the Russian Museum either on your own or on a skip‐the‐line tour with a guide. As the name suggests, the Russian Museum focuses on works by Russian artists only from the 17th century up until today. For the most part, these artists are less known outside of Russia, but they surely produced some truly stunning paintings and art works! I was very impressed. Entrance is 450 Rubel (about 6,50 Euros) for adults. Find out more on the museum website. Only a 40 min. bus drive from the city, you'll find another great example of Russian splendour: the Catherine Palace. Just as in the Hermitage Museum, I would recommend you to book a tour with tour guide. You will get so much more historical insight as if you would just stroll through the impressive gold rooms by yourself. Plus, you will have the bus transportation from and back to the city centre covered and you might stop at the Lenin Memorial. Inside the Catherine Palace you can also see the famous "Amber Room" – or at least a recreated copy of it as the original room was lost in the chaos of World War II. The impressive fountains at Petershof Palace are another well‐known attraction of St Petersburg. The famous fountains are only in operation during the summer months though, so it’s best to visit Peterhof during the warm season. A guided tour with transportation is recommended. When Peter the Great founded the city of St Petersburg as Russia's "gateway to the West" in 1703, he built the fortress as a way to fight off the then powerful Swedish army. As a serious attack never came, however, the fortress was more commonly used as political prison and private cemetery for Russia's royal Romanov dynasty. Today, the Peter and Paul Fortress also includes the State Museum of Saint Petersburg History as well as the Peter and Paul Cathedral. To learn more about the intriguing history of St Petersburg, book a guided city tour that already includes a stop and admission to the fortress. 8. Try some yummy Russian Food! Russian Food is a lot better than its reputation. At least in St Petersburg! The Marketplace chain (several branches, for example at Nevsky Prospect 92), offers a varied choice of fresh salads, meat and vegetables for "health‐conscious" eaters. Just like in many other of the popular St Petersburg "self‐service places", you pick up a tray, then go around the various stations and let the cooks behind the counter know what you would like to have. I was also positively surprised by the prices. If you do a little research, you can eat well but very cheaply here (more in the "Soviet Charm" section). For more info on typical Russian dishes to try in St Petersburg, check out my post A Quick Guide to St Petersburg, Russia. Even though it’s been almost 30 years since the fall of the Berlin Wall and the subsequent end of the Soviet Union, Russia’s communist past can still be experienced on a visit to St Petersburg. Kvartirka Soviet Café (Nevskiy Ave. 51): Reasonably priced food in an interior that has not changed since the days of the Soviet Union. SB Stolovaya No. 1 (several branches, for example at Gribojedowa 14 close to the Church of the Spilled Blood): Even without knowing any Russian, ordering was not too difficult here as you go past all dishes on display with a tray and then just point to the ones you would like. Most dishes also had a description in English. I had an extremely cheap lunch here (220 Rubels = around 3,15 Euros for a three‐course meal and a drink). Plus, the nostalgic interior made me feel like I was sitting in the living room of a former soviet home. Pyschnaja (Bolschaja Konjuschennaja Uliza 25): The only two items on the menu of this original Soviet standing café are coffee "from the draught" and pyshki (a ring‐shaped Russian donut). Lenin Memorial and a giant Soviet Building behind: If you booked a guided bus tour to the Catherine Palace (see point 5), you might stop here on the way back to the city. It all looks pretty gray, especially on a cold November day. But I guess that's part of the allure. The State Museum of Political History of Russia: Learn all about the country’s turbulent past, including the times of the Russian Revolution and the Soviet Union. You will find the current entry prices and how to get there on the museum's website. The Hermitage Museum (see point 3): As of 2017, there is currently an exhibition about the Russian October Revolution in 1917. If you're fan of ballet, St Petersburg is one of the best cities in the world to see a world‐class show! Examples for popular grabs include tickets to the Swan Lake Ballet or a Skip‐the‐line ticket for a show at the famous Mariinsky Theatre. Another way to learn more about Russian culture is the fun Russian folk dance show + dinner at the Restaurant Petrousha (4, Konnogvardeysky Blvd). 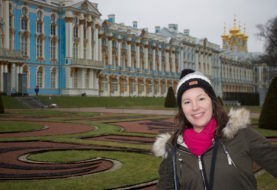 Have you visited St Petersburg and have some great tips? 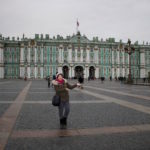 Or are you planning to visit St Petersburg and still have some questions? Let me know in the comments below! Disclosure: This blog post includes affiliate links to tours and activities offered by the booking website GetYourGuide.com. If you click on any of these links and make a booking through this link, I will receive a small affiliate fee. For you, this service is of course absolutely free of charge.